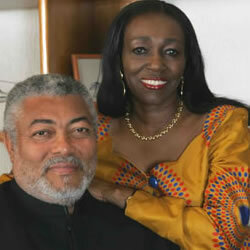 ACCRA, Ghana, Sept. 28, (GNA) - Nana Konadu Agyemang Rawlings, former First Lady at the weekend, observed that women are the only oppressed group in society that live in intimate association with their oppressors. MOSCOW, Russia, Sept 27 (APA) - A regional bank for South America, the Bank of the South, with a $20-billion initial capital has been set up under an agreement signed by seven nations – Argentina, Bolivia, Brazil, Venezuela, Paraguay, Uruguay and Equador – on the sidelines of the South America-Africa summit in Venezuela on Saturday, APA kearns from Moscow. 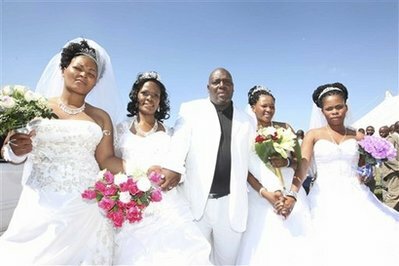 WEENEN, South Africa, Sept 27 (AP) – Milton Mbhele showed up for his wedding in a white limousine — with four brides. The women in white gowns each received rings and a kiss from the groom at a ceremony Saturday attended by hundreds of people. On Sunday, the families gathered for a second traditional Zulu wedding and planned to exchange gifts on Monday. PORLAMAR, Venezuela, Sep 27 (IPS) - A declaration that puts an accent on the positions of the developing South and expresses a renewed commitment to cooperation in the fight against poverty and for development was signed by the leaders who met over the weekend in the second South America-Africa summit, on the Venezuelan island of Margarita. ACCRA, Ghana, Sept 27 (GNA) - Tourism experts and think tanks would meet in Accra, from September 22- September 27, to mark World Tourism Day. ACCRA, Ghana, Sept 27 (Ghana Business News) - Ghana earns $2.3 billion from its mining sector in 2008, the third quarter report on the country’s mining sector released by a research company has said. 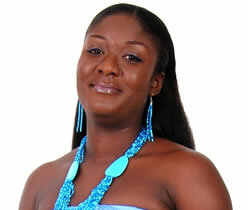 ACCRA, Ghana, Sept 27 (Ghana Business News) - The cynics and skeptics say she is only a young woman but the truth is that Sheila Ako, owner of Lisle Grandeur, publishers of In-Thing Maglogue has a kind of academic background that is solid like a rock and has very good eyes for fashion.